Manchester United will have to rip up the form book if they are to claim victory at Valencia in Champions League Group C on Wednesday, according to the English club's manager, Alex Ferguson. United, who will be missing injured striker Wayne Rooney, have won just one of 18 away games against Spanish opponents, with eight draws and nine defeats, and failed to score on their last three trips to the Iberian nation. "It's always the hardest place for us to go if you give me that statistic," Ferguson said at a news conference at Valencia's Mestalla stadium on Tuesday. "The standard of Spanish football has always been very, very good. It's a difficult place to win, there's no doubt about that. "That's the great thing about the European Cup. You always get to play against fantastic teams in Spain, Italy and Germany. That's what makes it such a great tournament." Valencia, Champions League runners-up in 2000 and 2001, have made a bright start to their La Liga and European campaigns. They top the domestic standings after five matches, ahead of Barcelona and Real Madrid, and thumped Turkish champions Bursaspor 4-0 in their opening Champions League group match. United floundered to a 0-0 draw at home to Rangers on their European debut this season and were held 2-2 at Bolton Wanders in the Premier League at the weekend. 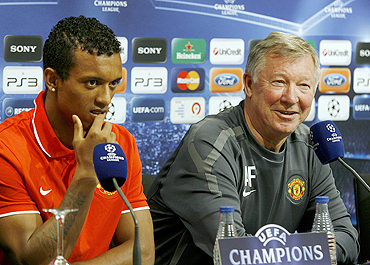 "Valencia's home record over the years has been very good and we respect that," Ferguson said. "They're very strong defensively and they don't surrender anything easily. "Hopefully we can impose ourselves tomorrow the way we know we can." The 68-year-old Ferguson said he would delay his decision on whether to include Rio Ferdinand in his starting lineup against Valencia until Wednesday. The central defender is returning from a knee injury and played against Rangers but missed the Bolton trip. "He's much fitter now but probably needs another game or so," Ferguson said, adding that he had no complaints about the recent performances of Jonny Evans and Nemanja Vidic. "It's a decision I'll take tomorrow about whether he (Ferdinand) starts or not but we're looking forward to having him back." Barcelona will not rush Lionel Messi back from injury for Wednesday's Champions League match at Rubin Kazan if he is not fully fit, coach Pep Guardiola said on Tuesday. The Argentina forward's presence for the Group D clash could be crucial after the Russians held the Spanish champions in Kazan in last season's group stage and then became one of only three teams to beat the Catalans in all competitions at their Nou Camp stadium in the return fixture. "The first thing is to look at Leo's ankle," Guardiola said at a news conference. "He'll train, we'll talk to him and to the doctors. We'll know the situation and we'll decide," he added. "It's a vitally important match but his health is the priority." World Player of the Year Messi was injured by a late challenge from Atletico Madrid defender Tomas Ujfalusi on September 19 and missed Barca's La Liga victories at home to Sporting Gijon and away at Athletic Bilbao. He was top scorer in last season's Champions League and netted twice in Barca's 5-1 demolition of Panathinaikos in their opening group fixture earlier this month. 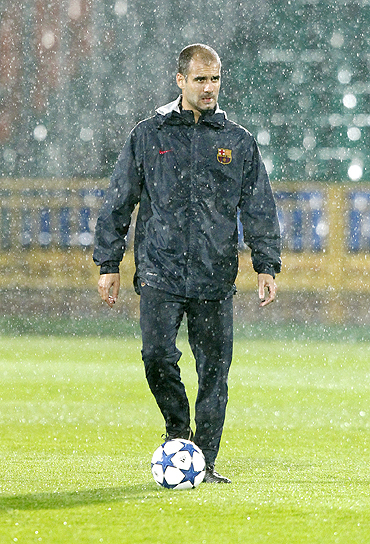 "It's going to be terribly tough (against Kazan)," Guardiola predicted. "The fact that they took five points out of six off us (last season) shows they are good. "They dominate the defensive areas in a way I have seldom seen in other teams." Central defender Gerard Pique said: "This is a test for us to see how we function away from home in Europe." He said the players were relieved not to have to play in the sub-zero temperatures that marked their trip to Russia in November 2009. "I don't know if the cold influenced last year's result but for us it's better that it's a bit warmer now," the Spain international said. Barca swapped their winter outfits for waterproofs on Tuesday as their training session at Kazan's stadium was soaked by a heavy rainstorm.